95 percent of teens between the ages of 13 and 17 now say they own or have access to a smartphone, compared to 73 percent in 2014-15. Teens are spending a lot of time online, and that can mean great things for your brand – if you know where they are spending the majority of that time and how to reach them. Here, we encounter another dramatic shift from a few years ago: Teens are vacating Facebook. In fact, the Pew Research Center study found that in 2015, 71 percent of teens used Facebook the most often, but now? Only 51 percent say the same. Facebook has been widely seen as the leading social media conglomerate for the last decade, but times are changing, as are teens and where they spend their time online. YouTube and Snapchat now lead the game with 35 percent and 32 percent of teens, respectively, claiming they use these apps the most. By using YouTube to reach teens, Adidas has seen a strong resurgence in recent years. 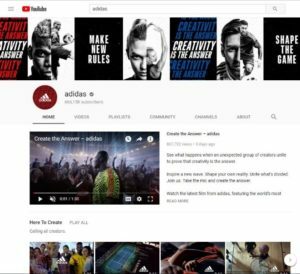 The brand used the “transformative power of sport” to build its following on the video platform – and was dubbed the fastest-growing sports brand on YouTube through its 2014 World Cup live-streaming series, “The Dugout.” Adidas also set its sights on young football fans by becoming the official sponsor of the Champions League. Find out how Adidas has turned these fans’ love of the game into love and long-term loyalty for the brand here. Until recently, it was believed that there was no way to tie an increase in sales to Snapchat because of the app’s lack of metrics. However, in the last few years, brands like Birchbox and Sour Patch Kids candy have begun using Snapchat to drive sales – Birchbox turned Snapchat followers into buying customers through simple vanity URLs, and Sour Patch Kids launched a challenge that earned the brand 120,000 Snapchat followers. Armed with this new information, we are able to make smarter choices about where we send our messages in order to reach our desired audience. The future of social media is infinite, with endless opportunities and possibilities that are waiting to be discovered.